B-52D Bomber Serial number 55-0062 currently rests at K.I. Sawyer Heritage Air Museum. This bomber flew training missions out of K.I. Sawyer. This aircraft was initially placed into the Strategic Air Commands inventory in February 1957. It was initially assigned to a Bomb Wing at Carswell AFB, Texas. This aircraft flew numerous missions over North Vietnam for 19 months while stationed in Guam and flew a total of 14,984 hours over a 26 year period. On September 15, 1983, the B52D 55-0062 flew into KI Sawyer for it’s final landing. This bomber was operated and flown by the 644th Bombardment Squadron since 1961. The 644th Bombardment Squadron was assigned to the 410th Bombardment Wing which was dubbed the “Guardians of the North. The 410th “earned the title of world’s best bomb unit for combat accuracy and was the first unit trained in both day and night tactics. Among the wing’s many accomplishments, it contributed to the U.S. victory in the Cold War, its tankers and crews saw action in Operation Young Tiger in 1965 and bomber crews helped make Operation Arc Light a success in 1968. More recently, the wing sent more than 450 people from all career fields as part of the coalition to turn back a dictator in Southwest Asia during Desert Storm (9). Not only did this bombardment wing contribute in combat missions but it also “developed important tactics, it was the first to use the Electro-Optical Viewing system, enhancing B-52 capabilities and extending its operational life. The wing was also the first to employ the Advanced Cruise Missile, conduct its follow-on testing and build the Air Force’s fleet of this stealthy smart weapon” (9). The 644th Bombardment Squadron won the Omaha trophy twice under the command of Charles Profilet. The Omaha trophy is presented annually as a token of appreciation to the Air Force command’s best wing. Charles “Chuck” Profilet commanded the 644th Bombardment Squadron December 1975 through July 1977 at K.I. Sawyer Air Force Base. His squadron consisted of 18 B-52 Bombers and nearly 200 crew members. During Profilet’s tenure at K.I. at any given time during his command a third of his aircraft and crews were on 15-minute alert with nuclear-loaded aircraft. Under Profilet’s leadership the 644th was named the best bomb squadron within the Eighth Air Force (10). The Eighth Air Force is a sector of the United States Air Force Global Strike Command. The command serves as the Air Forces Strategic Global Strike, one of the air components, of United States Strategic Command. Profilet’s crews successfully and safely flew night missions at altitudes lower than any other bomber crews in the command. The inspector General rated Profilets squadron as “excellent”. The annual in-flight evaluations of his flight crews resulted in a rarely seen “outstanding” rating. Chuck’s squadron was selected as the only B-52 unit to participate in long-range, open-area missions to locate Soviet combatant naval assets (10). George Dorman was born in Manistique, Michigan and joined the Air Force June 16, 1948 after he turned eighteen. He was sent to Lackland Air Force Base in San Antonio, Texas where he completed basic training which lasted thirteen weeks. After completing basic training George was deployed to Guam and was stationed with the 23rd Fighter Wing, George was stationed at many other Air Force Bases however he was always stationed with the 23rd Fighter Wing. After about 22 years of Service George had enough time in the service that he was able to retire. Around this time he returned home and was stationed at K.I. Sawyer Air Force Base in Marquette. He was stationed only 90 miles away from his hometown of Manistique. George did not enjoy his tenure at K.I. in fact he explained that he hated working with the bombardment squadrons. Dorman was used to fighter crews which consist mainly of a pilot, co-pilot and the radio communication from the ground. Bombers have a crew of 6 people on board and each person has a separate job on the aircraft. George described the crew as an airborne office of people. Each Crew has a tail gunner, navigator, pilot, co-pilot and bombardiers. The tail gunner is responsible for defending the air craft against attacks from the tail end of the plane. “The radar navigator is the B-52 crew member whose role is to identify targets and design the attack using cruise missiles, GPS guided weapons, unguided munitions, mines and so on, to achieve a specific level of target damage” (13). The pilot’s job is to fly the plane while the main job of the co-pilot is flight engineer. Only the pilot can reach the hydraulic systems and only the co-pilot can reach the electrical systems. The bombardier’s are responsible for targeting or triangulating the desired target area. George most likely did not like all of the moving parts required to operate a B-52 bomber in comparison with a fighter jet and shortly after being stationed at K.I. Sawyer he retired after 23 years of service and 7 years in the reserve. After the United States defeated Japan in World War II the Air Force realized it had a need for long-range bombers capable of carrying atomic bombs into war. Carrying atomic bombs into battle can prove difficult since some atomic bombs are as large as most automobiles. The Air Force could not decide which type of engine system to use and they were split between using jet and propeller driven systems. Jet engines burn through fuel very fast and some air force leaders saw this as a major disadvantage for a long-range bomber. The Air Force asked for a bomber equipped with propeller engines but the Boeing engineers returned to them the design of an aircraft equipped with jet engines. The engineers at Boeing did not believe that propeller engines would be able to accomplish what the Air Force needed of their new bomber. “The B-52’s creation legend has it that the bomber was designed from scratch during 72 hours spent inside a suite of rooms at Dayton, Ohio’s Van Cleve Hotel”. Although the drawings were in fact created in one weekend, the engineers were using years of wind-tunnel testing, jet engine innovations and their own engineering experience in building large aircraft. The Boeing engineers created their proposal and a scale model of the aircraft and presented it to the Air Force. “During the Cold War, the Air Force bought 744 B-52s, which were housed at more than 40 U.S. bases. Today, the Air Force flies 94 B-52s, all H-models built in 1961 and 1962.”(11). The B-52 is the only weapon in history to be in constant military use for 50 years. The Air Force plans to keep the B-52 in the Strategic Air Command’s inventory until at least 2040 and maybe even longer. The average flight time for the B-52H is about 14,000 hours. The jets’ flight time ranges from a low of 11,311 to a high of 19,891. “The Air Force predicts that B-52s will reach at least 28,300 flight hours before the upper surfaces of the wings begin to fail and the planes become too expensive to maintain” . The lifespan estimate is down 4,200 hours from the 1999 prediction of 32,500 hours. McGinley said the change was made to reflect that the aircraft are flying missions that put more stress on the airframe than had been predicted (11). There are 8 main variants of the B-52 bomber not including prototypes and aircraft that had less than 35 units produced. B-52A was an initial evaluation aircraft and was not a finalized design, in fact the design for the B-52 is continually tweaked over time to optimize and meet the needs of the Air Force. The B-52A was powered by P&W J57-9W engines, with 44.5 kN (4,535 kgp / 10,000 lbf) “dry” thrust each, or 49.0 kN (4,990 kgp / 11,000 lbf) “wet” thrust with water injection. Water injection adds mass flow to boost thrust on takeoff . The “B-52B” was very similar to the B-52A but had more operational systems. 50 were built, all by the Boeing Seattle plant. 27 of these were “RB-52s”, mentioned earlier, with provision for the installation of a pressurized reconnaissance capsule in the bomb bay. The B-52C has the J57 engine variants and similar avionics. The most visible difference from the B-52B was the fit of a huge 11,365 liter (3,000 US gallon) external tank under each wing. The water-injection tank in the rear fuselage was also removed, replaced by a water-injection tank in each wing root. The B-52C was delivered in natural metal finish, with a coat of white paint on the underside to reflect the flash of a nuclear explosion. The “anti-flash white” underbelly would also be retroactively applied to the B-52Bs. In addition, B-52s were fitted with “flash curtains” that could be put over the windows to block out the glare or a nuclear fireball, though it is unclear when this feature was introduced into production. The B-52C has one main significant difference from the B-52B and that is the ability to carry the reconnaissance pod was deleted. 101 B-52Ds were built at Boeing-Seattle, while 69 more were made at Boeing-Wichita, the first B-52 model to be built at that plant. A Wichita-built B-52D was the first of that variant to fly, on 14 May 1956. The “B-52E” featured improved internal systems. The Soviet air defenses had improved and adapted to high-altitude bombing rendering that tactic useless, the SAC switched to low-level tactics. The B-52E included new systems to support low-level bombing missions, an IBM-integrated AN/ASQ-38 navigation & bombing system was added featuring Raytheon AN/ASB-4 navigation and bombing radar and a GPL AN/APN-89 Doppler groundspeed / height indicator . The B-52F featured new J57-43W engines, with 49.8 kN (5,080 kgp / 11,200 lbf) “dry” thrust and 61.2 kN (6,235 kgp / 13,750 lbf) “wet” thrust, in a revised pod configuration. Each pod had its own water-injection tank in the wing next to the pylon, and there were three inlets under the pod, two for oil coolers and one for a 40 kW alternator. The new alternator replaced the original and unreliable bleed-air turbines. The B-52G was the most heavily produced B-52 variant. The internal fuel tankage was increased dramatically in this model. The hot piping for the bleed-turbines was removed which led to a redesign of the wing fuel storage arrangement. “Integral fuel increased to 176,507 liters (46,572 US gallons) and the wingtip tanks were reduced to 2,650 liters (700 US gallons), for a total fuel capacity of 181,808 liters (47,970 US gallons)”. The air frame weight was reduced by several tons and the gunner position was moved forward next to the rest of the crew and used an AN/ASG-15 FCS system with a TV link to control the guns. The climate control was improved in order to make long missions more comfortable especially in extremely hot or cold environments. 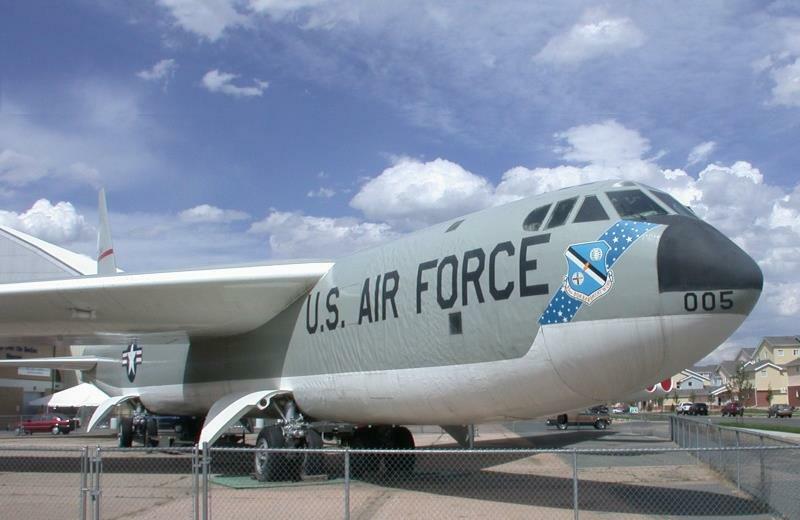 The nose of the plane was shortened while the tail was shortened by a few meters making the B-52G instantly recognizable compared to earlier models. The B-52G is fitted with a “GAM-77 (later AGM-28) Hound Dog” nuclear-armed turbojet cruise missile under each wing. This capability was added with the 55th production B-52G and then retrofitted to early B-52Gs. The engines of the two Hound Dogs could be used to provide additional thrust for the bomber on take-off, with the fuel for the missiles coming from the B-52’s own in flight tanks. An upgrade program named “Jolly Well” was implemented across most of the B-52 fleet in the early 1960s to bring the AN/ASQ-38 up to a more satisfactory level of performance and maintainability. “All 193 B-52Gs were built at Boeing-Wichita, though Boeing-Seattle provided the forward fuselage. The first B-52G performed its initial flight on 31 August 1958, with deliveries beginning in that year and ending in 1961”. Since the B-52 was mostly being used for low altitude tactics the B-52H was given structural reinforcements. It was also fitted with the P&W TF33-3 turbofan, a derivative of the J57, with 75.6 kN (7,710 kgp / 17,000 lbf) thrust. A B-52G had been temporarily fitted with these engines to validate their use for the B-52H. Other improvements include the replacement of the old .50 caliber quad turret with a 20mm GE M611 Vulcan six barreled Gatling gun type cannon. The Vulcan is capable of 6,000 rounds per minute with storage for about 1200 rounds. “Late production B-52Hs featured a second stores pylon on each wing, positioned between the two engine pods. 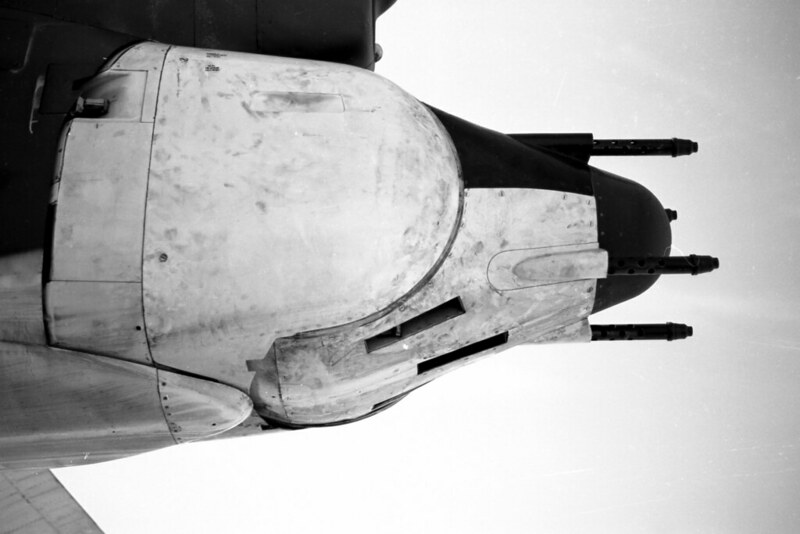 These short pylons were used to carry AN/ALE-25 chaff dispenser pods, which each contained twenty Tracor AN/ADR-8 6.35 centimeter (2.5 inch) folding-fin chaff rockets.The chaff rockets could be fired manually by the crew, or automatically by the bomber’s defensive countermeasures system. The pylons were retrofitted to earlier B-52H production and to the B-52Gs”. The first B-52H flight was on March 6, 1961. Boeing-Wichita built 102, with the last rolled out on June 22nd 1962, after a total production of 744 B-52s of all types at a cost of $4.5 billion USD(14). Bomber B-52D Model 55-0062 was stationed at K.I. Sawyer Air Force Base during the Cold War and was one of 18 bombers in use at Sawyer. The base was built in 1944 made operational in 1955 and decommissioned September 30, 1995. K.I. Sawyer is located in Marquette county south of Marquette. The base was in operation for nearly 40 years and was a key air force base during the Cold War due to its location in the northern region of the United States. The base was mainly constructed because of the Cold War so that the Russians wouldn’t be able to destroy everything with one missile. The runway construction was completed in 1957 and in 1958 25 F-102 Delta Dagger aircraft were sent from Kinross Air Force Base to serve temporarily . “The 62nd Fighter Interceptor Squadron from O’Hare airport in Chicago was transferred to Sawyer and became an operational F-101 “Voodoo” squadron in 1959 after the runways at Sawyer were extended to 12,300 feet” (8). “The Strategic Air Command (9) became operational as a tenant unit with the assignment of a KC-135 Air Refueling Squadron and soon was replaced by the 46th Air Refueling Squadron. The first B-52H arrived at Sawyer in August 1961 along with the 410th Bomb Wing”. The F-101 equipped 62 Fighter Interceptor Squadron was stationed at Sawyer as a tenant unit until 1971 when it was deactivated and replaced by the 87th Fighter Interceptor Squadron and its F-106 Delta Dart aircraft were transferred from Duluth Municipal Airport, Minnesota. The 87th FIS was deactivated and the F-106 aircraft left in 1985(8). B-52D Bomber Model 55-0062 currently rests at K.I. Sawyer Heritage Air Museum and has a rich history in the United States Air force. The B-52 has seen usage in Vietnam, The Cold and The Gulf War. In the 1950’s the B-52 set a world speed record of over 590 mph. Later on in the 1960’s the bomber set a world distance record for flying un-refueled for over 10,000 miles. The B-52 has a commanding presence and is one of the most respected aircraft in military history. This Bomber has been in military use for over 60 years and plans for decommission are not imminent This aircraft has had such a wide swath of impact across the world from Thailand, Guam, Korea all the way to K.I. Sawyer in Upper Michigan surrounded by the Great lakes. 1. Youtube. WNEM TV5. Marquette, Michigan, Nov. 1994. Television. 2. DISPOSAL OF K.I. SAWYER AIR FORCE BASE, MARQUETTE COUNTY, MICHIGAN. Rep. no. 960084. Department of the Air Force, Department of the Air Force, Brooks Air Force Base, Texas; AF. Vol. 19. Brooks Air Force Base: EPA Number: 960084, Main Report–501 Pages, Appendices–218 Pages, February 16, 1996, 1996. Proquest. Web. 3. Bleck, Christie. “Sawyer AFB Memories.” The Mining Journal [Marquette] n.d.: n. pag. The Mining Journal. Web. 4. Dorman, George. “Dorman, George (Interview Outline), 2013.” Interview. Grand Valley State University Libraries Digital Collectionns. GVSU, n.d. Web. 5. “B-52 In Cruise (2012).” Interview by Tech. Sgt Rebecca Zanetti 3rd Combat Camera Squadron. Youtube. Air Force., 23 Dec. 2012. Web. 6. Kong, Major. “Flying the B-52.” Daily Kos., 12 Dec. 2012. 7. “Boeing B52D “Stratofortress””. K.I. Sawyer Heritage Air Museum.,2015. 8. “The History of Sawyer.” Gwinn Sawyer Chamber of Commerce., n.d.
9. “SAC Bases: K. I. Sawyer Air Force Base.” Strategic-Air-Command. N.p., n.d.
10. “Charles W. Profilet 1958.” West Point Association of Graduates. Westpoint., n.d..
11. Rolfsen, Bruce. “The B-52’s Big 5-0 The Stratofortress Cuts a Wide Swath – and May See Another 40 Years’ Service.” Air Force Times. Gannett Co., Inc., 15 Apr. 2002. Web. 12. May, Bill. “50 Years Young.” The Journal Record. BridgeTower Media Holding Company, 16 Apr. 2002. Web. 13. Cenciotti, David. “Take a Seat next to the B-52 Heavy Bomber’s Radar Navigator.” The Aviationist., 2012. 14. Goebel, Greg. “[1.0] B-52 Evolution.” AirVectors. N.p., 2015.